In 2012, VCU Medical Center’s Office of Clinical Transformation, in concert with a group of ambitious clinicians and leaders, created a customized early warning system to quickly identify changes in critically ill patients. 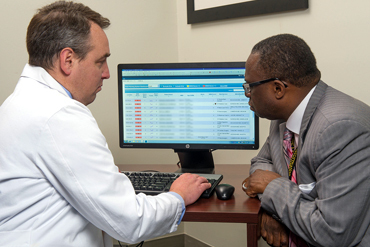 Developed by Colin A. Banas, M.D., M.S.H.A., chief medical information officer, a team of clinicians and information technology staff, the system pulls data from the patient’s electronic records to alert providers to potential changes in the patient’s condition. The system empowers the medical center’s Rapid Response Team, a group of clinicians who are in the hospital 24/7, to effectively triage and visit the most critically ill patients before their conditions deteriorate. The medical center’s early warning system has inspired other health systems to incorporate dashboard-type intervention, Banas said. In its first year of use, response from health care providers at VCU Medical Center has been positive. Providers access the innovative system nearly 100 times daily. The number of patients visited by the Rapid Response Team increased from 915 to 1,659 in the first year of implementing the system, and the number of patient “code blues” occurring outside of an intensive care unit has declined 20 percent. In short, sicker patients are being recognized and escalated to an appropriate level of care in a more timely manner.